Bulgaria is considered a great ski destination because it offers great value for money combined with remarkable nature. During the winter, skiing is the most popular tourist attraction in the country. There are 3 major ski resorts and many smaller ones scattered throughout the mountain ranges. Each with its advantages over the others. In this post we will compare the two most popular resorts in Bulgaria – Bansko and Borovets. We won’t be including Pamporovo into this comparison, as it is less appealing to international tourists, due to the long transfer time to get there and the small number of flights to the closest airport in Plovdiv. Each resort is located in a different mountain range. Bansko is situated in the Pirin mountains, while Borovets is in the Rila mountains. The Rila and Pirin mountains are divided by a valley and are close to each other, with the Rila mountains being further North. The ski zones in Bansko and Borovets are very different. In Bansko, most of the slopes are concentrated into one main ski zone on the top of the mountain, with a much smaller ski zone lower in the mountain. This means that most of the slopes are located close to each other and you can easily go from one slope to the other. Also, the main ski zone in Bansko is at a higher altitude than most of Borovets. The ski area in Borovets is divided into 3 zones: The Markudzhik ski center (this is the highest part of the ski zone and is serviced by a 4 seat lift and two drag lifts); The Yastrebets ski center (this zone is located at mid-level and is the most popular); The Sitnyakovo ski center (these are the lowest slopes on the mountain, but allow for a ski-in/ski-out accommodation and night skiing). Each ski center is located at a different altitude and they are not connected very well, so going from one to another is a little slow. Borovets also boasts great night skiing, which is open everyday from 6:30pm to 9:00pm. You can even get ski lessons during the night ski session. An advantage of night skiing is that lift lines are very small and the snow is nice and firm, even if it was warm during the day. The snowfall is generally the same in both resorts, however the season in Bansko often lasts longer than that in Borovets. But if it’s a good season in one resort, it’ll be good in the other as well. The lift infrastructures in Bansko and Borovets are both modern, with the exclusion of the odd lift here and there. In Bansko all of the lifts have been replaced with new, modern ski lift facilities. There is just one lift (the gondola), which takes skiers from Bansko up to the rest ski zones. It was built in the early 2000s and each cabin can seat 8 people. 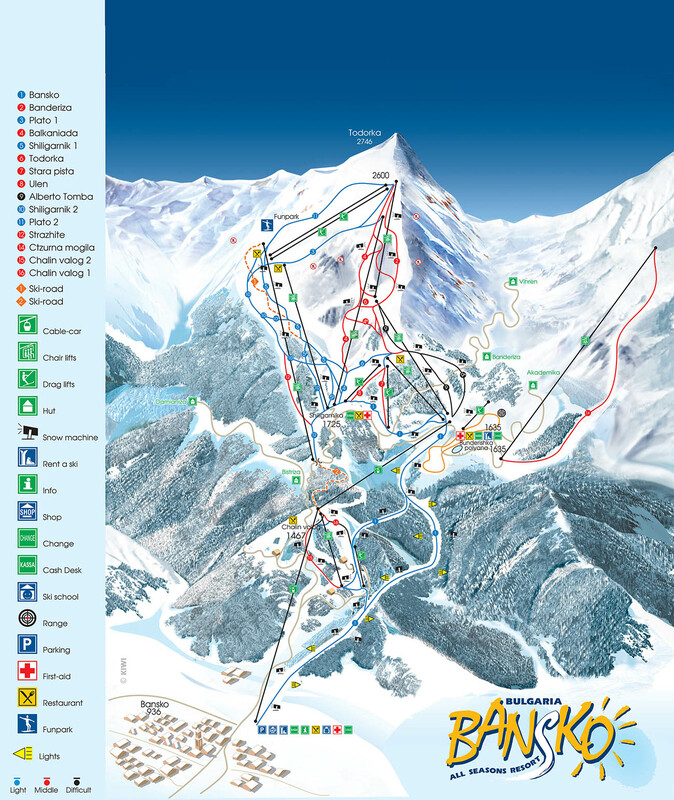 Other than that, Bansko has a total of 8 open seat lifts and 5 drag lifts. 90% of the slopes are equipped with snow canons, with only the Plato ski runs not having any. The lift “Tzarna Mogila”, even though it’s shown on the piste map, hasn’t been operational in decades. The slopes in Bansko are connected to the town below via a 15km ski road, which is ideal for beginner skiers when operating. During the high season in February, lift lines for the gondola are bigger than the rest of the season, so getting to the main ski zone can be slow at peak hours (read more about the Bansko gondola queues HERE). 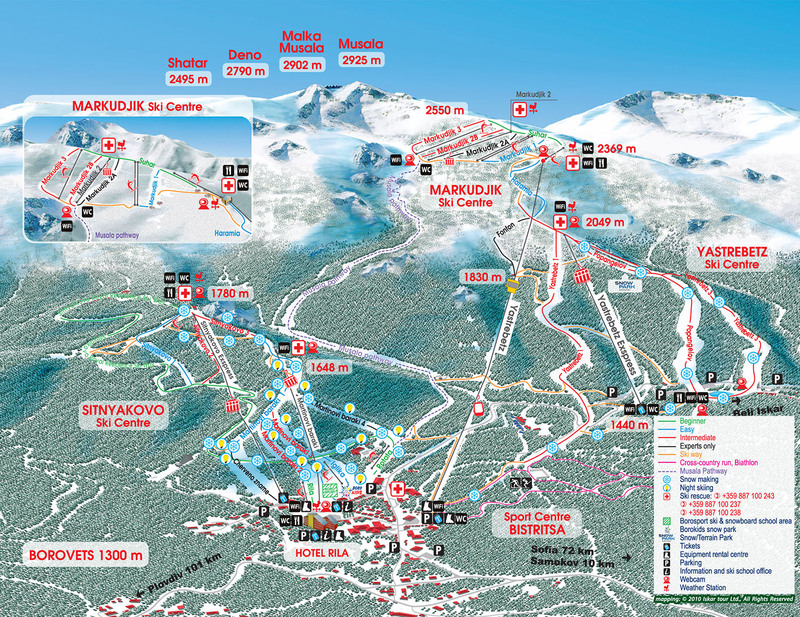 There are 3 lifts in Borovets, which take skiers up to the various ski zones. The most noticeable lift in Borovets, the gondola, was built in the 1980s and is still in use today. It can seat 4 people and takes skiers up to the Markudjik ski center in about 25 minutes. All of the open seat lifts in Borovets are relatively new, in good condition and very comfortable. Night skiing takes places in the Sitnyakovo ski center, in front of the Hotel Rila. The “Martinovi Baraki” lift, along with all of the drag lifts around it work during the night skiing session. One of the advantages of Borovets is that you can get to the Sitnyakovo ski center and start skiing directly, without having to take the gondola up. This splits up the tourists early in the morning so there are less lift lines during high season. 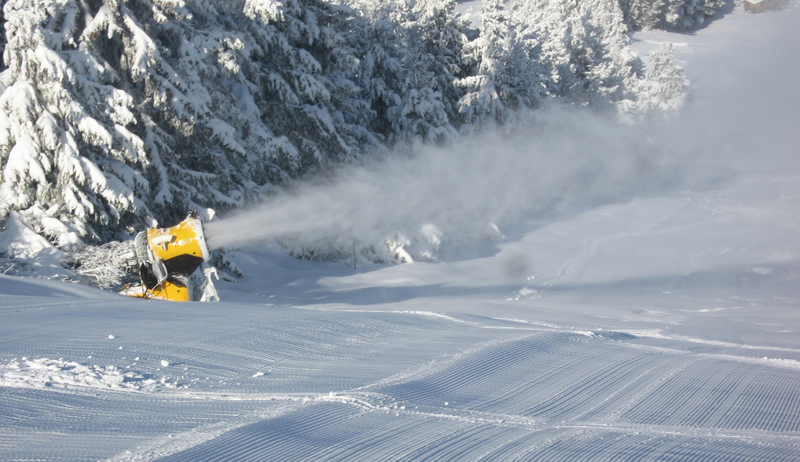 Most of the Sitnyakovo and Yastrebets ski areas are equipped with snow cannons, guaranteeing a good base for the season. Wiaitng time for the Gondola in Borovets is never an issue. The town of Bansko is situated at 900m. asl., while the main ski area is situated between 1635m. asl and 2560m. asl. The Chalin Valog ski area lays between 1100m. asl. and 1450m. asl. Borovets sits at 1300m. asl. with the Sitnyakovo ski center starting there and going up to 1750m. asl. The Yastrebets ski center is between 1440m. and 2050m. asl. The highest ski zone, the Markudzhik ski center sits between 2140m. and 2483m. asl. Both resorts have a great reputation for being suitable for first time skiers. The ski schools in Bansko and Borovets consist of experienced instructors and there is decent competition between the various ski schools, so they are all trying their best to please their clients. One of the differences between the two resorts is that the ski school for beginners in Borovets takes place on the lower slopes (no waiting time for the lift, but snow coverage might comprise artificial snow during shoulder seasons), while the ski school in Bansko takes place higher in the mountain, where snow conditions can be better or harsher depending on the weather (and where waiting time for the lift might be an issue). Bansko has a much larger selection of private ski schools you can choose from, other than the resort held schools. Borovets also offers the option to take skiing lessons during the night skiing sessions. This gives skiers the option to ski freely during the day or rest and take a lesson in the evening (read more about the night skiing in Borovets HERE). During the high season (February), ski schools in Bansko tend to be crowded, with groups often exceeding 15 people. Borovets, on the other hand, tends to have smaller groups during the same time period. An important thing to remember is that Bansko and Borovets are two different kinds of resorts and this affects the available accommodation and prices. Bansko is a resort built around the town of Bansko, which has been around for hundreds of years. Its infrastructure is that of any normal town and is much bigger as an area than Borovets. Hotels and apartments are abundant and this keeps the prices low. In Bansko you can find many small family hotels, run by people born in the town. There is a general assumption that the bed base in Bansko is too big for the ski area, which leads to bigger lines during the high season. Borovets is quite the opposite. It was built 120 years ago specifically as an alpine resort for the then aristocracy of Bulgaria. Of course they weren’t skiing back then, but the infrastructure has evolved in a different manner, compared to that of a normal town. Borovets as a resort is in the middle of a forest at the foothills of the Rila mountain. There are fewer hotels and restaurants available and accommodation prices are higher than those of Bansko. The bed base is also much smaller, so the total number of visitors in Borovets compared to the size of the ski area is better. 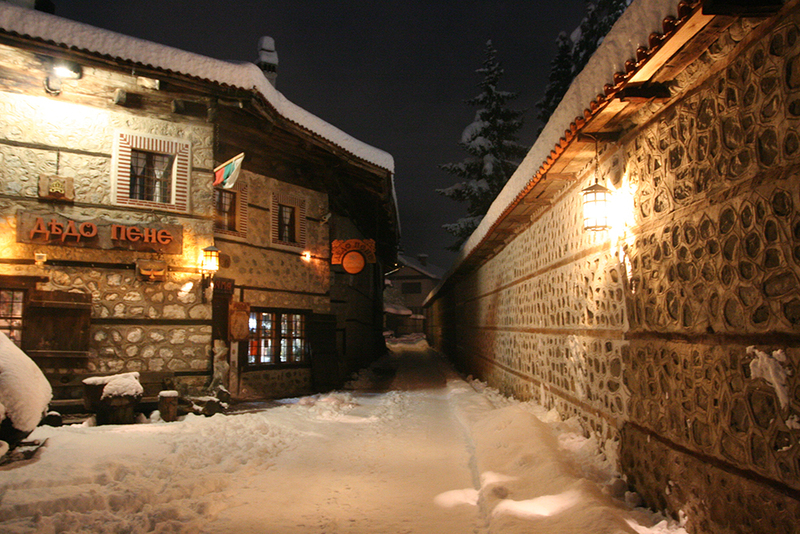 One of the many traditional restaurants in Bansko. Bulgaria is well known for its nightlife. Both resorts have a great nightlife scene during the winter season, with cheap prices and full bars. Bansko has more bars and restaurants, spread over the whole town, while Borovets has fewer, but they are concentrated in a smaller area, so going from one to another is much quicker. Bansko also has a much wider variety of restaurants, snack bars, fast food, supermarkets and so on. If you’re staying in Borovets, you can always take a cab to the neighboring city of Samokov for dinner and a night out. The drive is only 10km. Pictured above is a traditional “mehana” in Bansko’s old town. Both resorts offer an array of non-ski activities that you can take part in. If you fancy horseback riding, Borovets has this on hand in the resort itself, while in Bansko you will need to go to the neighboring village of Banya. Both resorts don’t have naturally occurring mineral springs on site, but there are close by. When staying in Bansko you can go to Banya (6km) or Dobrinishte (8km) for a mineral bath in small complexes. If you are in Borovets you can go to Sapareva Banya (39km), where you can find a huge facility with over 10 indoor and outdoor pools. Out of the two resorts, Bansko is better suited for guest who do not plan on skiing much, as the town itself offers plenty to do and see. You can visit cultural sites, such as churches, old houses and monuments, or you can take a walk down one of the shopping streets. 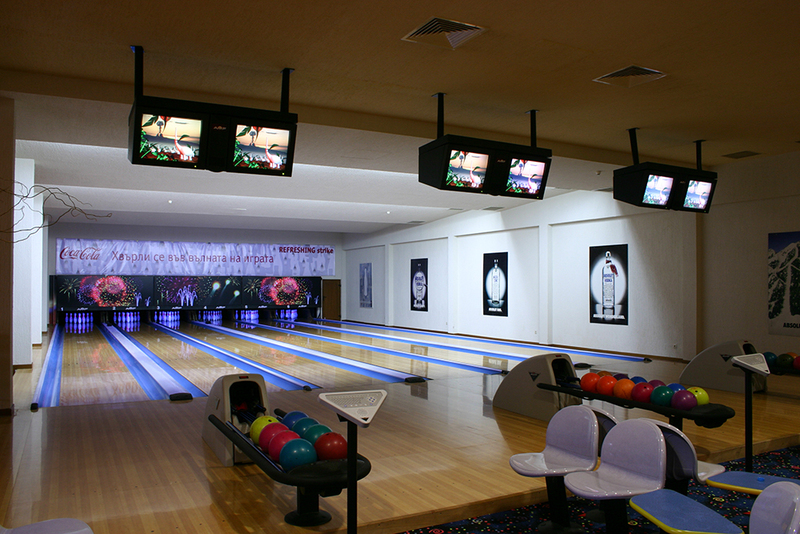 There are some activities available in Bansko, which you won’t find in Borovets, such as an ice skating rink, bowling ally and escape room.